13th Regiment: * Distinctive colour black, red corners, silver as metal. Was granted its flags with the cypher of Frederic II in 1741. The eagle, which is traditionally of black colour, is of the metal colour when it lies on a black background. From 1713 to 1720, the distinctive colour had been blue, flamed yellow corners, gold as metal. From 1720 to 1729, the distinctive colour had been blue, flames of the inversed beckground colour, flamed yellow corners, gold as metal. From 1729 to 1741, the distinctive colour had been black, red corners, gold as metal. 14th Regiment: * Distinctive colour purple red, gold as metal. Was granted its flags with the cypher of Frederic II in 1742. Since 1713, the distinctive colour has been purple red, gold as metal. 15th Regiment: (3 bat.) The background was made of a single piece of fabric, the vertical stripes cannot reproduce the look these flags should have had. The flags were made of a mixed white and silver damask silk. Was granted its flag with the cypher of Frederic II in 1742. 16th Regiment: * Distinctive colour orange, flames of the inversed background colour, gold as metal. Was granted its flag with the cypher of Frederic II in 1742. Since 1713, the distinctive colour has been orange, flames of the inversed background colour, gold as metal. 17th Regiment: Distinctive colour purple red, purple red corners, gold as metal. Was granted its flag with the cypher of Frederic II in 1742. From 1713 to 1742 the distinctive colour had been purple red, purple red corners, gold as metal. 18th Regiment: * Distinctive colour blue, flamed red corners, silver as metal. Was granted its flag with the cypher of Frederic II in 1742. In 1713, all of its flags were Leibfahnen, white background and center, gold as metal. In 1716, the distinctive colour was blue, red corners, gold as metal. In 1731, the distinctive colour was blue, flamed corners, opposed red and blue on the Leibfahne and red and white on the Ordinärfahne, gold as metal. 19th Regiment: Distinctive colour purple-red (or brilliant red), Johanniterkreuz, gold as metal. Since 1713. Was granted its flag with the cypher of Frederic II in 1742. 20th Regiment: * Distinctive colour green, gold as metal. Since 1713. Was granted its flag with the cypher of Frederic II in 1742. Brandenburg suffered heavily under the 30-Years War(1618-1648) and lost estimated 1/3 of its population. Under the rule of Friedrich Wilhelm I (The Great Elector), the situation of Brandenburg was consolidated. Refugees from all over Europe settled down in Brandenburg, agriculture and industries were improved. And the personal of the army increased from 8,000 to 23,000 men. Normally the military colours of the Electorate of Brandenburg showed the red eagle of Brandenburg. When Marquis and Elector Friedrich III crowned himself as Friedrich I, King "in" Prussia in 1701, the design was changed. In the centre of the flag was a slightly oval disc, called mirror. Within the mirror was a black rising eagle, the eagle of Prussia. The eagle was placed above a landscape and did his way towards a faced sun. There was an additional scroll within the mirror having the motto "NO SOLI CEDIT" (He even does not give way to the sun). His son King Friedrich Wilhelm I (the soldier king) made further improvements in all branches of administration and colonized the country by 15,000 fugitives from Catholic Salzburg Archbishopric. And it was he, who increased the personal of his army again up to 83,000 men. Brandenburg had only just 2.5 million inhabitants then. Since 1735, a Prussian infantry regiment consisted of two battalions, each having five companies of musketeers and one company of grenadiers. In action both grenadier companies formed their own battalion. During war a regiment had 50 officers, 118 NCOs, 50 musicians, 12 carpenters, 196 grenadiers and 1220 musketeers. Until January 1757 the staff increased up to 1800 men in the regiment and another 754 in the grenadier battalion. The Colours: Since King Friedrich Wilhelm I the Colours had been standardized. According to source in 1740 the flags were nearly squares of 150cm x 150 cm, the paintings of the flags however always have ratio appropriately 19:18, i.e. the height was slightly bigger. Each regiment had 10 Colours, one for each musketeer company. The grenadier company had no flag of its own. The flags were of very cheap quality, they were made of thin silky taffeta. The ornaments had simply been painted upon the flags by oil colour. The ornaments were a wreath surrounding the mirror and topped by a royal crown. In each corner was a cypher showing just initials without the "number" of the ruler. A flying cannonball outward bound was in the middle of each quarter. The ornaments were either golden or silvery depending on the sheet's colour. The infantry regiment number is always abbreviated as "no.x" and as "i.r.x." The 1st company always had a special flag, the Colonel's Colour (German: Leibfahne; although a regiment often had been commanded by officers of higher rank), which had a white sheet. The other nine companies all had the same flags, Regimental Colours (German: Ordinärfahnen) without any distinguishing marks. Their sheets were not white. The regiments were distinguished by the colours of their sheets. The typical Regimental Colour had a non-white sheet with a white mirror in its centre. Each mirror showed a black flying eagle, armed and crowned golden and holding a sword in his right and a bundle of flashes in his left claw. 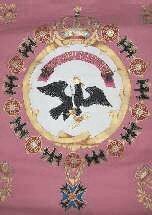 The eagle was facing the flyend upon all infantry flags. Above the eagle was a scroll having the same colour as the sheet and containing the motto "PRO GLORIA ET PATRIA" (for fame and fatherland). This new pattern was introduced by Friedrich II in 1740. A general suggested "PRO DEO ET PATRIA" (for God and fatherland). But this was refused by the king, who had the opinion that would be an abuse of the name of God, who wouldn't mix up human struggles. All flags having the old pattern, had been removed until 1747. The Colonel's Colour had inverted colours due to the Regimental colours, i.e. white sheet, a coloured disc with a white scroll. The ornaments had the same colour as the Regimental Colours of the same regiment. Some regiments had additional quadruplets of wedges (e.g. i.r.17), wavy wedges (e.g. i.r.46), piles (only once in combination )or wavy piles (e.g. i.r.21) or a combination of two of those quadruplets (e.g. i.r.34). If those quadruplets were white upon the Regimental Colour, they had the colour of the sheet upon the Colonel's Colour. If those quadruplets had a different colour, this colour was the same upon Colonel's and Regimental Colours (e.g. i.rs.27 and 32). If the mirror or background of the cyphers had different colours, this colour was also the same upon Colonel's and Regimental Colours. All Colours had a gilded lance head or sponton with the cypher. They were fixed upon the hoist by ca. 30 nails, which later had been used in a special ceremony called the "nailing." Usually at the top of the hoist, just below the sponton a silver standard's ribbon was fixed ending in two silver tassels. Despite of the garrison regiments there were two general exceptions (i.rs.19 and 40). The colours of the I and II garrison regiments were of the same type like those of the infantry regiments (in field). Beginning with the III garrison regiment the pattern was simpler. There was just a big cypher in the centre, surrounded by a wreath topped by a crown. There were four additional bigger flying cannon balls, one in each corner. The ornaments and cyphers were either golden or silvery. Some regiments had wedges upon their Colours. I don't know, whether the 1st company had a special white Colonel's Colour. As the flags had been planned as very cheap combat flags, it couldn't be expected that all the eagles and ornaments had the same shape as in these modern images. Infantry Regiment No. 10 "Prinz Dietrich"
Infantry Regiment No. 17 "von de la Motte"
Infantry Regiment No. 19 "von Friedrich"
The 19th regiment was established in 1702 by merging of two companies respectively of already existing regiments nos. 4,6,7 and 12 and additional staff from other units. Lt.General Albrecht Friedrich Marquess of Brandenburg-Schwedt was appointed as its first commander. The commander also had the title of a Lord Master (German: Herrenmeister) of the Sovereign Military and Hospitaller Order of Saint John. Probably for this reason the Regimental Colour has the same design as the Grand Master's flag of the Sovereign Military Order of Malta, superimposed by the other details of Prussian infantry flags, and the basic colours of the Colonel's Colour just had been inverted. Infantry Regiment No. 21	"von Marwitz"
Infantry Regiment No. 27	"Prinz Leopold"
Infantry Regiment No. 32 "Jung-Schwerin"
Infantry Regiment No. 34 "Prinz Ferdinand"
Fusilier Regiment No. 40 "von Kreytzen"
The Black Eagle Order (Hoher Orden vom Schwarzen Adler) was established by Friedrich's grandfather King Friedrich I on the day just before his coronation, it was not dedicated to units, but only to Prussian knights. Maybe the chain was added in 1750, when Colonel Johann Friedrich von Kreytzen became commander of the regiment, for he is the only knight of the order and commander of the regiment in times of king Friedrich II the Great. The "retro" colours of the regiment von Kreytzen No.40 recreators. Thanks for your interest in the regiment von Kreytzen No.40. We had our regiment flag painted by a professional flag painter named Dr. Hans Bleckwenn. Some interesting facts about the Schwarzer-Adler-Orden (Black Eagle Order). Normally the order was awarded to any general having at least the rank of a lieutenant general. Although our foremost regiment’s owner Georg Christoph von Kreytzen gained this rank at the end of his career, the honour to bear the order on our flag can not be traced to him, because he hardly ever appeared on the battlefields, nor to his other commanders. The first owner and founder of the regiment was, as described on our website ( Prussian Regiment of Kreytzen Füsiliers No.40), Wilhelm Heinrich, Duke in Eisenach-Jena. By his marriage with Sophie Charlotte of Brandenburg-Schwedt, he gained the order in 1723 for just being a cousin of the Prussian regent. Probably as a poor compensation for the loss of a complete regiment from Saxon into Prussian service (Eisenach belonged to Saxony), this special flag had been awarded. Infantry Regiment No. 46 "von Württemberg"
Fusiliers were the normal light infantry of the Prussian army. Fusilier was originally the name of a soldier armed with a light flintlock musket called the fusil (French for flintlock). The word was first used in the 1600s, and later came to be a regimental designation. "Normal" infantry regiments were known simply as Infantry Regiments (Infanterie-Regiment); regiments 33 and 35-49 were fusilier regiments (Füsilier-Regiment). The private soldier of these regiments was a Musketier or Füsilier respectively. Frederick used the name Fusiliers, but they served, and were largely equipped, as line infantry (they did wear different caps, though). There were several regiments of light infantry - the jäger zu Fuß and the so-called Frei battalions - but they were such an irregular crowd of brigands, I would hesitate to use the word "normal." The soldiers of the latter battalions were called Füsiliers. Of these units - there were nearly twenty altogether - only the Freikorps zu Kleist carried colours. Frederick the Great raised a number of second-line infantry regiments to garrison towns and fortifications during the Seven Years War. At first they were not trained for field service or in some cases, granted colours. However, a shortage of front line soldiers eventually made it necessary to activate these garrison regiments into regular combat infantry, and when this happened they were all granted their own colours. The most senior of the Garnison-Regiments date from the reign of Frederick's father - GR1 was raised in 1718, GR2 in 1717 and so on. While they would not be composed of the fittest men, they would always be expected to serve in combat if the tide of war rolled their way. The Land Regiments were a different matter - they were the local militia and of little military value. As for the colours, [fie36] states that colours were carried from when the individual regiments were raised.